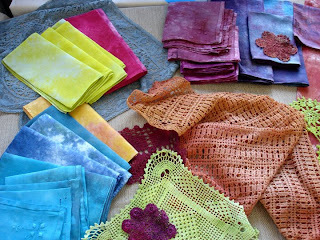 I have armloads of beautiful linen and lace now. I dyed oodles last week, mixing turquoise, blue, two yellows and black. 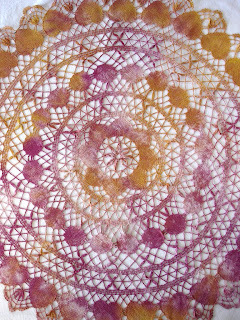 This wheel of lace is hand-tatted and measures about 24 inches across. It is a stunner. 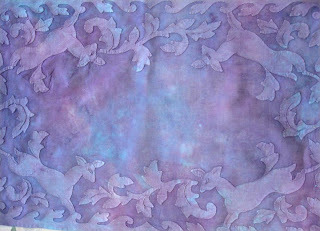 These two placemats are the first of eight. 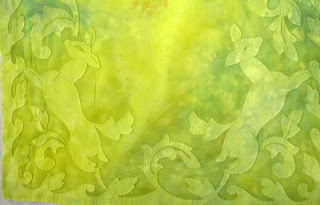 They are hand-appliqued cotton voile. Amazing work. I also began, at last, to dye the mounds of linen napkins I've collected. 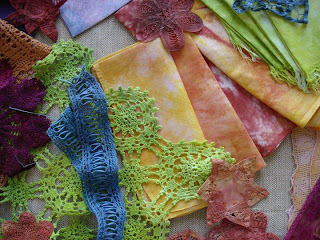 You can choose your favorite when Boston Handmade comes to the South End Open Market Sunday June 14.
gorgeous! I love the colors on those dyes!